Now that realism was the basis of the rapidly evolving Disney animation, providing a connection for the audience that more rudimentary cartoons could not provide and permitting them to recognize themselves in Disney characters as they recognized themselves in live-action stars or the characters in literature, Walt Disney was in the business of creating life. “Most people think the word ‘animation’ means movement, ” Ken Peterson, a Disney animator, once explained, “but it doesn’t. It comes from ‘animus’ which means ‘life’ or ‘to live.’ Making it move is not animation, but just the mechanics of it.” “We invest them with life,” Walt told a reporter of his animated creations. Disney animations were of life, but they were larger than life too. What Walt sought was not an imitation of life as it was, which live-action films could do better than animation, but life as one could exaggerate it – a “caricature of life,” as Walt called it, rooted in realism but expanding upon it. Walt’s animated reality would not only be more outsized than real life, it would be simpler, clearer, sharper and finally better. Taken from The Triumph of the American Imagination, by Neal Gabler. Animation exaggerates, simplifies, caricaturizes, and abstracts something from the real. It’s a simplification and emphasizing notion. So we have reality – which is amazing in and of itself, but can be very complex and ‘noisy’. By abstracting reality – we can do this by using film (live action) we can emphasize and simplify something from reality. So one could view film as one level of abstraction away from reality. The actor/director/film maker (in the live action film) abstracts something from reality and tries to pull something out of reality that we can relate to but that they can emphasize. It’s a distillation process. If we get a live action film which is totally accurate to reality we don’t get much abstraction. We still get some abstraction due to the nature of film (or video or what have you), but a film that tries really hard to mirror reality will probably not be interesting to us. If we want to ‘watch reality’ then we’ll just do it on our own (why pay good money for that?). Even ‘reality’ TV shows are an abstraction or reality (through filming and editing). We are seeing a ‘portion’ of reality, that portion which the film maker wants us to see and experience… woven together to make something entertaining. The next level of abstraction is animation. It is, as Walt says, an exaggeration of life (reality). It’s distillation at its extreme. Here we emphasize only very certain specifics, making sure we are still tied to reality, but going beyond it. That’s why I liken animation to painting. Good paintings do a similar thing, they abstract something from reality and show us that one main thing. So let’s say we have some performance capture (where basically a computer captures the movements of an actor and they are ‘transposed’ to a 3d model). That performance capture is abstracted, but mainly on one level (at the actor level). The same level as a live action film. That is why motion capture is more like photography. It’s a level one abstraction. Animation is a much more focused abstraction – what I would call a level two abstraction. It’s much more simplified and emphasized. I think that as a result this is why animation is much more suited to (or perceived as belonging to) children. This links to the post Mark Mayerson made regarding consistency. Mark reminds us that there needs to be a consistency between design and motion (where a toony character needs toony motion, or a live action character needs live motion). When you mix the live motion with a toony character (or vice versa) you get weird results. There also has to be, as Mark says, a consistency between acting and design. Simple characters require simple acting. Why? I think the reason is because of the levels of abstraction. If we are going to abstract something from reality, I think we want to keep on one level. If we mix levels of abstraction we get into trouble. A toony character with complex acting doesn’t work – it’s overacted. A live action actor acting like a toon doesn’t work (probably couldn’t be physically possible). A toony character moving like a live action actor doesn’t work. I’ve always maintained that animation is all about convincing movement and acting. But I’ll add to that – animation is all about convincing movement and acting, but the movement and acting have to be at the same level of abstraction or we can potentially (and actually) confuse our viewers. They will be getting a mixed signal. I’m still here! Even though it’s been quiet on the blog front, I’ve been busy working, playing, reading, learning… you know, living. As an update I’m about 1/2 way through Preston Blair’s book – drawing at least one or two images from each page. I’ve tried my hand at some character designs that I may post in the near future (one specific one anyway). In my reading I seem to be on a biography wave. I’ve recently finished reading Charles M. Schulz’s biography (Good Grief, The story of Charles M. Schultz). To be honest, it was an interesting, but depressing read. Charles Schulz really was Charlie Brown – actually he was a bit of all of the characters, but mainly (I think) Charlie Brown. The biography wasn’t what I expected – a chronological one, instead it jumps around from topic to topic. The other biography (which, thankfully, is traditionally chronological) that I’m now working through is Walt Disney’s biography by Neal Gabler. Talk about a detailed study! It took Gabler 7 years to research the book and he had unlimited access to the Disney archives. I’m only about 100 pages into the 800 page book, but it’s definitely an interesting read. Staying on the book topic, I found a beautiful copy of the book “Treasures of Disney Animation Art“. It is a large format book and it really brings you close to the art work. It contains a variety of images: rough/cleaned up animation sequences, inspirational art, final art… totally worth having. In between sleeping, eating and working I’ve been trying to increase the amount of drawing/painting that I do. I find it really does make one much more observant – moreover it’s a lot of fun! 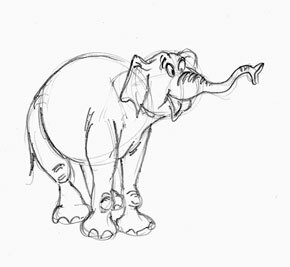 Anyway, this little fellow is my take on an elephant image in Preston Blair’s book Cartoon Animation. I’m working my way through the book by copying at least one or two drawings from each page. I’m on page 57. The idea is to copy artists I like, but only as a primer to get my own style to sprout and develop. The way I see it is that copying a favorite artist will help you to learn what it is that you like about their style. Then you incorporate what you learn into your own style. The end or goal isn’t to be another Preston Blair or Freddy Moore, rather it is to be yourself. But a new you that is informed by what you like in other artists’ work. Another good idea is to copy different styles (toony work, realistic work, reality itself). In between copying other artists work, one ought to work on his or her own designs and ideas. Slowly, you stop copying as much and become more creative by creating more of your own work. I don’t think you should stop copying altogether – since I believe you can continue to learn from other people’s work. Going through this process solves a couple of problems. One is that you are always learning something new. If you ever think you’ve arrived – well, then your growth will stop and you will more than likely stagnate. The second problem has to do with quantity. In order to get better you have to draw more. Copying will help you to get those bad drawings out of your system. Moreover, copying will help you to have a standard against which you can measure your copies. It’s much easier to see what is wrong with your version of someone else’s work when you can compare the two (your copy vs. the original). The point is that copying isn’t the end all be all of drawing (unless you are satisfied with copying), rather it is a tool to get you up and drawing better and faster. The same applies to animation. We copy reality, other people’s interpretation of reality, but the point isn’t to be a photocopy machine. The idea is to learn what there is to learn about animation (and continue learning) and then create your own. Be careful not to get stuck in copy mode. It’s safe, but not very creative. Bobby can paint and it’s great watching him go through the process. I would certainly take his philosophy of life with a grain of salt, but as a digital painter he rocks. Here are some rigs for Maya that are all itching to be animated. So if you need a new character there is quite a growing list here. Yes, Character B is there too! A bit more of a technical guide, but for those learning 3d in director, it’s a great place to start. If you haven’t been to the Gnomon Workshop lately, there are some new tutorials. I haven’t had a chance to download any of the new ones yet, but if they are like the other videos you will most likely learn something new! This blog is dedicated to the work of Glen Keane, one of the best anmiators of our time. Totally inspiring. Watching the Cal Arts lecture and seeing Glen animate is amazing. I wish the quality was better, but I’ll take it as it is! Lots of great character designers/designs. Lots of inspiration.